Risk and reward are often closely tied together. Such was the case with this moody image from Olmsted Point in Yosemite National Park. Last week’s Eastern Sierra workshop came had amazing weather conditions. The blank blue California skies, that so frequently dominate the season, were nowhere to be found. In their place Mother Nature provided an amazing array of atmospheric conditions. While workshop schedules are often driven by available conditions, we always plan to shoot the last sunset of the workshop at Olmsted Point in Yosemite. It’s a, fresh, different view of [wikipop]Half Dome[/wikipop] that many people have never seen. The challenge was that the Tioga road had closed, because of snow, at the start of the week. We pressed on with the workshop with a “wait and see” attitude in regard to our foray into Yosemite. Less than 8 hours before our last sunset, the road reopened. We piled into our vehicles and drove the snowy road into the park, stopping at a couple of locations before arriving at our Olmsted Point destination. As we pulled into the parking area, rather than a grand vista, we were greeted by thick fog. With visibility around 50 feet we shot a few images of fog shrouded trees while we waited for clearing. After a while, Gary suggested we hike out to the point and hope for the best. While the fog had lifted somewhat, all of the mountains were still completely obscured. The group scattered and tried to make the best of it, finding compositions here and there. We watched our watches as sunset time approached and light grew darker. As the sun was setting, magic began to happen in front of us. The fog started to drop and the view opened up. Still shrouded in mist and evening color, Half Dome emerged. I choose to keep this image dark, to preserve the colors in the sky and clouds. While dark and moody, I like how it turned out. The exposure was 25 seconds at f/13 and ISO 100. I was using my 5D and 24-70 lens @ 70mm. 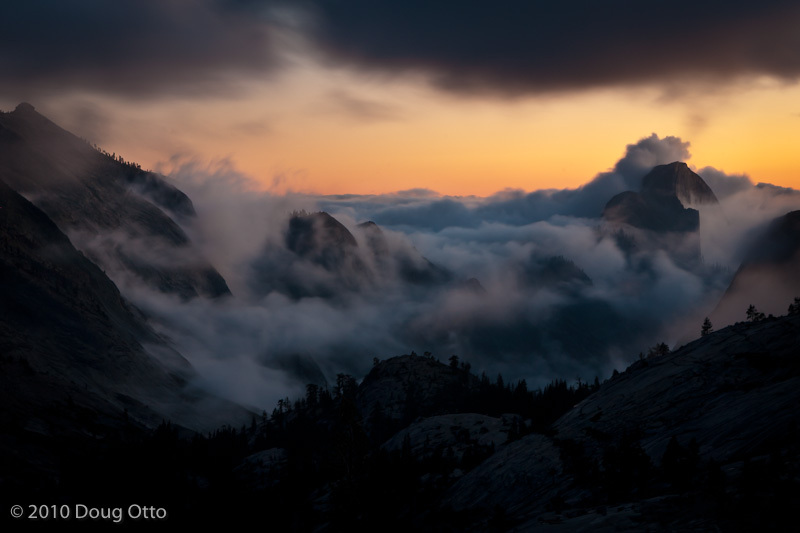 This entry was posted in Photography and tagged Canon 24-70 f/2.8L, Canon 5D, doug otto, dusk, fog, Olmsted Point, yosemite national park. Bookmark the permalink. A unique and awe-inspiring photograph of an amazing view. Love the narrative, and I am sure your workshop participants appreciate the vision and guidance offered to get them to witness a scene such as this. Thanks David. It started out looking pretty bleak but turned into an amazing evening.